The Slimline M4 Triple Shingle is a redesign of our best selling M4 Triple Shingle. 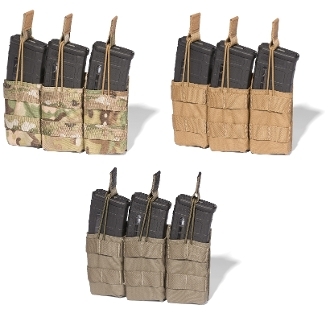 We've made a minimalist shingle out of it by reducing the width of the shingle and the height of the pockets, which has the added benefit of leaving a little more of the magazine exposed for easier gripping and retrieval. And, due to the 500D Cordura construction and by using our SAS (Snapless Attachment System), the shingle weighs just 3.7 ounces. In order to assist with magazine retention, the back of each pocket is lined with SureGrip material, and also uses SureGrip on the bungee pull tabs. The shingle measures about 8 ⅛ inches wide, about 5 inches tall with a 4 inch tall magazine pocket, and is about ½ inch thick. It uses 5 channels and 5 rows of MOLLE space.